Kies does not support your device via Wi-Fi network. The wireless network where the computer is connected to is different from your mobile's wireless network. Both devices have to be connected to the same wireless network for them to sync properly. Sharing is disabled on Windows OS. Certain computer application is disrupting the connection. Now that we already have determined the possible causes, we may now start troubleshooting the problem. o Touch Menu from the Home screen. o Touch Settings to get to the settings menu. o Touch Connections to continue. o Touch Kies via Wi-Fi. NOTE: If Kies via Wi-Fi is not in the list, this means that your device is not supported by Kies. Your next option is to connect using the supplied USB/Charging cable for your device. Step 2. Check wireless network for both the computer and mobile device. Your Galaxy S5 and the computer has to be connected on the same wireless network for them to sync. NOTE: The computer has to be connected over Wi-Fi, instead of LAN cable. Step 3. Check for any computer application, which likely blocks communication/connection between Samsung Kies and your device. 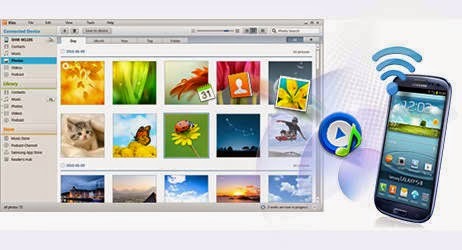 Computer programs like firewall, anti-spyware, anti-malware, anti-virus and other security suites are found to block Samsung Kies from accessing and transferring information to your mobile device. As resolution, we suggest you to disable or turn off these programs temporarily when you are encountering connectivity issues. Make sure you are following the correct steps when you attempt to connect to Kies through Wi-Fi network. For those who need help in doing so, you may refer to this content.